Observed along a drainage ditch in Eldoret, Kenya, April 2013. 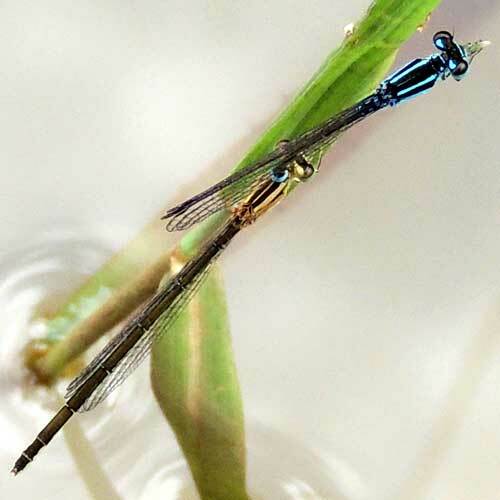 The immature stage of damselflies reside in streams or pools of water where they are predators on mostly small aquatic invertebrates. The adults are gem-like in their colors, especially the males, and both sexes have delicate wings that are held vertically and folded together dorsally when not flying. In the photo there is a male with electric blue on the thorax and abdomen. There are special claspers at the terminus of his abdomen, and with them he has a hold on the female just behind her head. It is common for many dragonflies and damselflies to remain in this coupled state for minutes or even many hours. In this way the male monopolizes the female while she lays eggs fertilized by him and often in territory that he will defend against competitors. Copyright Michael J. Plagens. Page created 20 December 2013.